pictured (3rd from left) with Sr. Mary Flanagan, President Award Leader at DIT. 29 September 2011: Four students from DIT Aungier Street were each awarded today with a gold medal from President Mary McAleese. The DIT awardees Mark Jones, Conor Downes, Elaine Bolger and Liam Stewart were among a special group of 70 exceptional young adults from across Ireland presented with a Gaisce Gold Award by President Mary McAleese at a special ceremony in Dublin Castle. Gaisce ‐ the President’s Award ‐ is Ireland’s most prestigious and respected individual award programme and aims to support the development of young people, social fabric and the growth of active citizenship. Gold, Silver and Bronze awards are conferred and recipients must set their own challenges in four areas including Community Involvement, Personal Skill, Physical Recreation, and Adventure Journey. Only a small number of people persevere to the point of actually receiving the Gold award. This year’s Awards are particularly special in that this is the last group of gold medal winners to be honoured by President McAleese as she steps down from her second term as President. She said that it had been a tremendous experience for her honouring Ireland’s youth over the past 14 years. Sr. Mary Flanagan, President Award Leader at DIT said: “I am delighted to congratulate Mark, Conor, Elaine and Liam on their Gaisce Gold Awards. At DIT we encourage our students to give something back and we have a very active volunteering programme, so it is especially heartening to see four of our students recognised nationally through their Gaisce Gold Awards for their community, sporting and civic contributions”. A number of years ago Mary read me a passage from a book called the Secret, one of those positive thinking style compositions that went something like this. If you work with all your heart and soul for something positive, the Universe colludes to help you. Well feel is that the Universe certainly colluded and brought us into contact with the students in DIT. For those of you who haven’t heard of The Dublin Institute of Technology, it is the biggest Third Level educational establishment in the country with 23,000 students and an amazing array of disciplines. We have had our fourth annual group of Easter Volunteers and like the others before them they were astounding. Each and every one of them made their own unique and lasting impact on people who have just the most tenuous link with existence imaginable. It just leaves me speechless each time they come, as to how they relate to the world’s poorest as if it is something in the Irish psyche that bonds us to those who are seeing the poverty of our ancestors. Or maybe those chosen to come are, in themselves, open to doing good, or maybe both. I am not a fan of the volunteering as it is commonly perceived and practiced by many nowadays. Come when you like, commit to nothing and take no responsibility, after all you’re not getting paid for it. My view is, that if you volunteer, it’s the real deal, you must be totally committed as if you were the most highly paid imaginable. I also have a problem where people raise money from the general public to fund trips for volunteering purposes, where the output is often way short of the expectations of the donors. I feel 40% of my effort was helping the villagers to remember what they knew themselves; 30% was encouraging them to believe in the skills and abilities they had rekindled; 25% was the pure spirit of Northern Malawian women; remote rural women, who are strong, intelligent, determined, bright, cheerful and powerful, against all the odds. Maybe I get 5% for showing up. I imagine if the crisis in Sub Saharan Africa could be solved easily, it would already have been done alrady, after numerous studies, reports, strategies, plans and billions of dollars. But it’s not easy. It’s complex, confusing, frustrating annoying, amazing, challenging but never boring or bland. The rural women we work with deserve canonization, considering what they achieve with nothing. Imagine what they could they do if they didn’t have to spend their lives having and feeding squads of kids, spending untold hours carrying water, and firewood, having to cook and clean and till and sow and harvest. My name is Lynne Swan. I am 20 year old journalism student from Dublin, Ireland. I was selected as one of eleven students to volunteer with Wells for Zoe in Malawi during Easter 2011. I wanted to come here as I had heard about the great work Wells for Zoe had done and are continuing to do in Malawi by providing opportunities for Malawian citizens and letting them know that just about anything is achievable. Since my first day here I’ve learned the true value of communication within the communities here. I’ve heard numerous stories of how Wells for Zoe changed hundreds of people lives just through word of mouth and thus being able to find out which communities need clean water. I absolutely love being here helping out John and Mary and meeting the amazing Malawian citizens but at the same time I cannot wait to go home and spread the good word of the constant work of Wells for Zoe here in Malawi. I definitely want, and very much hope, to come back to Malawi again so that I can help to continue the amazing and life changing work Wells for Zoe do here. This is the fourth year that DIT students have come here to help with the NGO and I hope that there will be many more students volunteering here in the near future. We visited schools, fixed pumps for the wells, visited Mzuzu Central Hospital and have gone to local communities to identify needs and talk to villagers. It has been an absolute honour to have been able to converse with so many wonderful Malawian people and I truly believe that they can achieve what ever their hearts desire once NGOs like Wells For Zoe are around to inspire and assist them in doing so. Having spent just over a week here so far I am in awe of what could be achieved if we stayed longer or came back again. John and Mary Coyne have achieved so much with Wells for Zoe and I am proud to be able to say that I have assisted them with even just a tiny percentage of that great work. I’ve made life-long friends and met people that I will never, ever, forget. I am just back from Malawi and should be dead or at least ready for the bed after 32 hours driving, flying, hanging around and waiting; not at all endearing but by far the worst part of our work in Malawi. Arriving home I was driven to read and answer my emails and head out to talk to the Young Engineers Society, something I had agreed to months ago and hadn’t really planned. The meeting was on volunteering and I felt that the students were bombarded with ideas of building houses, digging latrines, doing manual labour and raising funds for the pleasure of making their contribution to the other 90% somewhere around the globe. I was last of six presentations, and I’m sure I came across as a scattered nutter without a plan. In fact we have few impositions on our volunteers other than that the pay their way, be themselves, try to inspire, educate and challenge and absorb what they can every second of their short period of voluntouring. And even though we get all our volunteers to journey with our people in their daily lives, what can you achieve in one or two weeks; it’s a toe in the water (but don’t take that literally), a glimpse at society, a taste of what you might do in the future where ever you are. What it can do is let you touch and feel, get little glimpses, shake a hand, hug a baby, blow a bubble and indicate solidarity. You can inspire, you can educate, make your mark and leave a lasting impression but permanent change is a long haul. People often ask me would I not be better sending out the money and stay at home, and I suppose the idea has merit, but to the people we work with it’s more about inspiration and dignity than money. Africa is full of monuments to egos. People want to do things for them rather than with them and so we have worked hard with communities to find out what they really need as distinct from what the want (everyone wants everything). Women in villages always need and want water as a first priority, when we meet with them, food is second and education third. All our volunteering has a relation to these areas. We also build houses, schools and recently a factory and lodge, but we get local communities or contractors to do this work because we don’t like telling young highly educated white people that the value of their labour is less than 400 Kwacha a day (less than 2€), which is factual but not inspiring. So what are short stay volunteers doing? : they’re learning. The other night I mentioned designing for the other 90%, but I think the point was lost, by me as well as the audience. The brains of the world are focused on technologies and goods for the developed rich world while so few focus on simple things for the poor and underdeveloped. Why did I have to spend 9 months in 2005 trying to find a low cost, simple sustainable hand water pump: because no one was on it, except Richard Cansdale in the small village of Hartburn in Northumberland and a Baptist Minister in Bolivia. Why are so few on a cheap LED projector using low cost solar panels for education, strong bicycles for ambulances in rural areas. Organic pesticides, green manure, ……….. It’s a huge market but maybe it’s seen as inferior and less financially rewarding. What is wrong with simple technologies for the other 90%?. Irish people are known for their innovative streak. We have large numbers of undergraduate and graduate thesis produced daily and I wonder what percentage focus on a real issue for the developing world. Is the fault with the institutions, the students, the academics or society in general? For the past two years we have had hugely successful relationship with student volunteers from DIT and this year we have moved into placements and academic areas, which is very exciting. Maybe these placements, and links in Malawi may expose students to the real issues, where those with a problem solving inquisitive nature may get a chance to work with real people and their problems and research real solutions. The academic value of volunteering has still to be tapped, and we are hoping our continued association with DIT in the area of Business, Marketing, Computer Science, Early Childhood Development, Nutrition, Solar Power and Students working with Communities will all provide opportunities for students to observe, understand and, most of all think, about finding solutions to the many issues holding back real development in a climate of aid dependency. We hope to develop this work in a spirit of providing opportunity rather that handouts, believing that inspiration is much more powerful tool than charity. Imagine Ireland hundreds of years ago, no mobiles, no bebo and more importantly… no clean drinking water. Where would you be? How would you cope? Can you even imagine? Well unfortunately, it is still happening in parts of the world. Why am I telling you something you already know? Because GCD has students that want to make a difference… Are you one of them? After visiting Mzuzu in Malawi in 2005, retired couple John and Mary Coyne, a property developer and a teacher, decided to set up the Wells for Zoe charity. The name for the charity came from Richard Cansdale, whose daughter Zoe was killed tragically in a motorcycle accident. Zoe is also the Greek word for life, so Wells for Zoe means “Water for Life”. Richard was the man who finalised the design for the Cansee pump. The group focused primarily on providing the region with fresh clean drinking water, however now they have branched out into a wide range of different projects in order to develop the area. But two people can’t fix an entire country’s problems, but fortunately, that’s where Griffith College students come in. Two first year students, Paul Durning studying Business and James Walters from the Journalism faculty have already made it over to the African state and it has made such an impression on them that have decided to go that one step further. 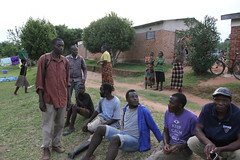 Together with the help of the Griffith Students’ Union, they have decided to get a group of 17 students from all 5 faculties over to Malawi in early 2009 to help make a difference to the lives of hundreds of people. Where are we going? Malawi is said to be the heart of Africa, the people are so friendly and welcoming impression to their visitors. It is roughly 4 and half hours from the airport in the capital Lilongwe where the students will fly into. Once we arrive there, we will be collected by two army jeeps donated by the Irish army earlier this year to complete the journey to Mzuzu. The original idea of giving the people fresh clean water came from the fact that only 19% of pumps over 25 years do work. 60% don’t work on any given day. Imagine walking 6 miles for a bottle of water only for the shop to be closed, and not having a mobile phone to call someone to come and fix the well. The Wells for Zoe charity’s goal is to supply the region with the Cansee pump. These pumps are easy to set up and quick to repair, they are also cheap at just $30 each. The charity are now in the process of setting up a pump factory, which will bring jobs and wells to the country. They are also setting up an agricultural college in order to educate the people on how to farm and generate their own business and capital. At the moment Malawis’ agricultural sector is where Ireland was 100 years ago. 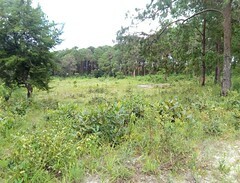 The college is about people learning about different methods of farming, for example, compost making, crop rotation as well as a whole wide range of new innovative farming techniques. Wells for Zoe is based on a very simple concept “A hand up, Not a hand out”. 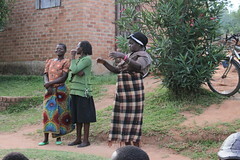 They believe in inspiring, educating and challenging the people of Malawi in order to help them, help themselves. Some of the stories Paul and James could tell us were amazing. One woman got a 0% interest loan in order to set up her own charcoal selling business, she became very successful in her venture and is now in the process of returning her 0% interest loan. This woman came from nothing and is now an entrepreneur in her own right and all because of just a little help from Wells for Zoe. So what will Griffith students be doing there? Last year, when DIT students went there they worked with the Malawian people to set up a school and garden in the community of Luvuwu. 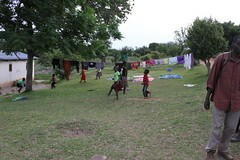 Since the school was set up, the community has set up a youth society and an AIDs support group as well as the garden being developed further. 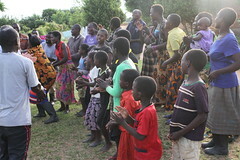 When Wells for Zoe visited the area in August, the drama society in the youth group was able to put on a play for them promoting awareness about HIV and AIDs. Our aim is to undergo a similar project and hopefully name the project after Griffith College with the aim of achieving the same self sustainability. How can you help? Each student will be funding their costs both from their own pocket and through support by sponsorship. Between now and the end of January, we shall be doing various fund raising events which we need everyone to dig deep and support what can only be described as a great cause. We hope to raise more than the necessary amount so we’ve more than just our physical efforts to give to the people. So even if you’re not travelling with us you can make a difference. If you wish to just make a donation, or know someone who would like to make a donation, the Students’ Union are setting up a bank account where you can lodge money either anonymously, or through us. Remember, every little counts. You can give a hand up to those who need it without even going out of your way.